Performance Micro Tool offers 24-hour fast turn service on standard and special tools. If you need tools tomorrow - either our in-stock tools or your custom design - give us a call. We will make every effort to provide the tools you need fast. Performance Micro Tool can design tools to fit your process or special cutting requirements. We have designed tools to cut everything from very hard abrasive temperature sensitive material to very soft (butter like) material. The tools displayed on this web site cover only a small portion of what we are capable of providing. We can modify a standard design to fit your specific needs in length, diameter, add a drill point, etc. Custom coatings are also available on any of our tools. 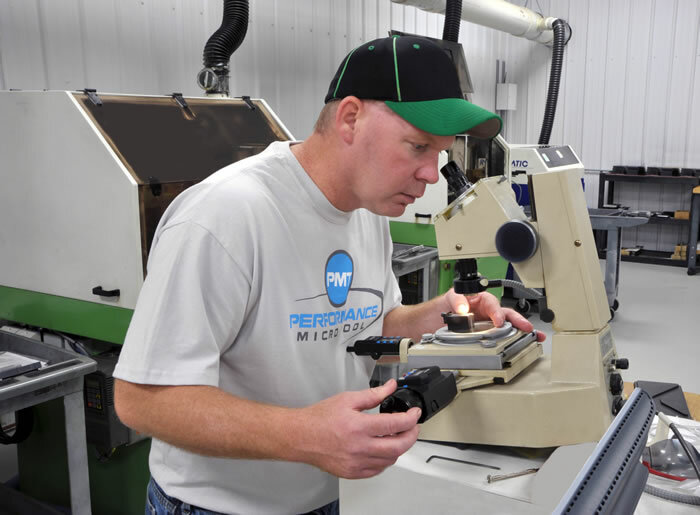 Our engineers have years of hands-on experience in all aspects of micro tool design, manufacturing, and tool usage. We can provide ideas on how to optimize your process including tool selection, feeds and speeds. If you are working with a material that is difficult to cut or have special requirements we can design a tool customized to your process.